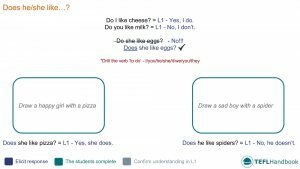 A collection of English teaching resources to teach beginner level students (A1) how to express likes and dislikes. This lesson plan includes a sample board, along with practical activities and games that require very little pre-planning. The board work below offers one suggestion on how to lead-in with this topic. Start off by reviewing/revising the more familiar first and second person constructions (I do, You do etc.) before introducing the third-person form of the verb do. As always, use the colour-coded text on the boards to give you an idea of what you should be trying to elicit. The best way to view these boards is through the TEFL Handbook app. So if you have an iOS or Android device, be sure to check it out. A warm-up activity where students review food vocabulary and give their preferences. Teacher: Do you like cheese? The students will create and complete a table of their food preferences. This writing activity follows on from the previous exercise. Draw a table in the centre of the board with the column headings I like and I don’t like. Have the students copy the table and complete it with their preferences, using the food items from the previous activity. 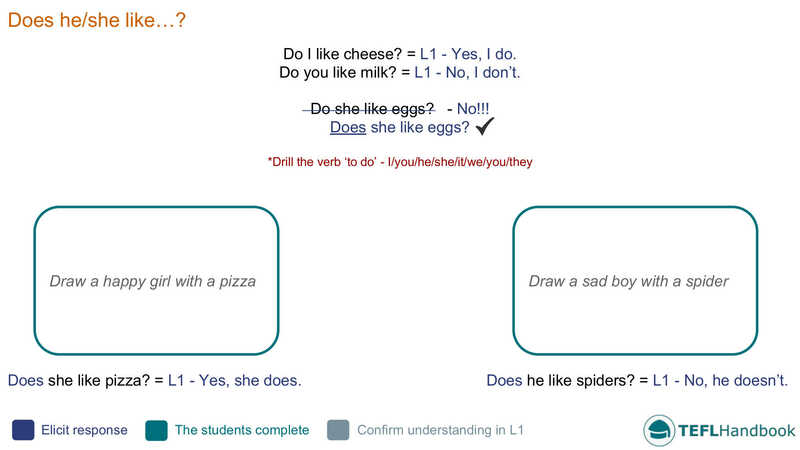 Students have to switch tracks and report on a partner's preferences in the third person singular. Teacher: Whose book do you have? Student: It’s John’s book. / John’s book. Teacher: Does he like eggs? A fun memory game that uses the target language for the lesson. Teacher: (Pointing) Does he/she/John like cereal? For an alternate approach to teaching this topic, have a look at the lesson plan Food I like/don't like from the British Council site. It'll require a little more prep time and may need to be adapted, but it's packed with fun and creative ideas for teaching likes and dislikes. There are a number of fantastic ESL resources on iSLCollective for teaching this topic. A couple of our favourites are "What do they like?" and "Like, love, hate + -ing". Both cover expressing likes and dislikes in the third person singular. Have the students watch this quick video from Maple Leaf Learning. It won't take long to prepare a few questions related to the target language for this lesson, as well as anything else you want to revise. If you've found these ideas useful, be sure to check out our complete list of ESL lesson plans for beginners (A1 Mid-level), as well as our entire collection of ESL lesson plans. Our suggested next lesson is on daily routines. Also, iOS and Android users can access all of our materials through the TEFL Handbook app. An ESL lesson planner for EFL - ESL teachers.